(UnhappyFranchisee.Com) Now that we have exposed the BizCom Press and Dr. John Hayes “12 Amazing Franchise Opportunities” books as a deceptive pay-for-play ploy designed to mislead prospective franchise investors, it’s interesting to look back at the pre-expose press releases and see how blatantly each company lied about its involvement with the deceptive “12 Amazing Franchise Opportunities – Second Edition” program. Nowhere in the press release, in the book description on Amazon, or in the book itself did BizCom Press, Dr. John Hayes or Restoration 1 disclose that not only did Restoration 1 pay a fee to be endorsed as an “amazing” franchise, the company actually provided the text for the book chapter that heaped praise on Restoration 1 – as if written by Dr. John Hayes. After UnhappyFranchisee.Com broke the story that Dr. John Hayes’ and BizCom’s “Amazing Franchise Opportunities” books were undisclosed pay-for-play advertising vehicles masquerading as the legitimate selection and analysis of an independent franchise expert, BizCom admitted that participants had paid to be included and had provided their own chapters. Instead of retracting its press release and issuing a statement or apology for its role in a misleading (at best) marketing ploy, Restoration 1 and Gary Findley doubled down by releasing its own sloppily branded edition of the book on Amazon. Having once headed the Curves franchise organization, Gary Findley is no stranger to franchise disaster. Once news broke that he had publicly boasted about receiving recognition that his company had bought, paid for, and even authored, one might expect a shred of embarrassment. I mean, does Restoration 1 distribute press releases every time they run a franchise sales ad? So how did Restoration 1 decide to proceed with publishing its own deceptive book instead of, say, demanding its money back from BizCom for putting it in such a publicly embarrassing situation with possible legal consequences? Now this is conjecture, but I imagine that when the embarrassing information leaked, Gary Findley got the senior franchise marketing team together and patched in Dr. John Hayes & BizCom’s Scott White and Monica Feid from their franchise sales booth on the beach at Spring Break in Palm Beach. Seriously, the idea of honesty and transparency seems to get rejected faster than a bad heart in some areas of the franchise sector. Restoration 1 proceeded with the ideas proposed in the imaginary Gary Findley scenario. Restoration 1 left the press release expressing Gary Findley’s delight at being “chosen” by Dr. John Hayes on its franchise propaganda blog. BizCom proceeded to post the Restoration 1 branded excerpt of the “12 Dishonest Franchisors” book complete with a visible “fiverr” watermark on the front cover, the word “oportunity” in the table of contents, and the tiny disclaimer “Sponsored advertising content. Restoration 1 provided this chapter to tell its story.” clearly intended for anyone reading the book through an electron microscope. 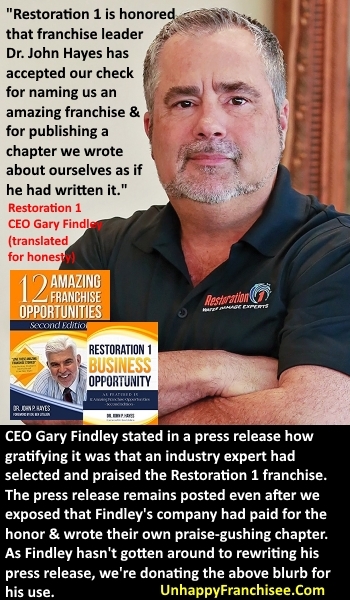 Gary Findley and/or Restoration 1 marketing executives have an open opportunity to explain their side of the story, to explain how our assumptions are unfounded or incorrect, or to acknowledge that, perhaps, they messed up and should make things right. 1) Is Restoration 1 committed to complying with the FTC rules requiring the disclosure of payments, compensation or other significant business ties to those providing expert endorsements of companies? Do you agree that if being named an “Amazing Franchise Opportunity” was contingent upon the payment of a fee, that Restoration 1 is likely legally (or at least ethically) bound to clearly state that Dr. Hayes provided a paid endorsement? 2) Is Restoration 1 committed to transparency and honesty in its recruitment of franchise investors? Is publishing a chapter that is written as if an objective 3rd party heaped praise upon Restoration 1 (when, in fact, Restoration 1 was heaping praise upon itself) consistent with your commitment to not misleading or deceiving potential franchise investors? 3) In hindsight, does Restoration 1 regret participating in the “12 Amazing Franchise Opportunities” venture and/or regret prominently posting the paid nature of the promotion? Was the hasty publication of the Restoration 1 branded e-book a good idea? 4) In deciding whether to buy a chapter in BizCom’s book, did you or the marketing team at Restoration 1 weigh the potential downsides if the financial arrangement was exposed? Did you worry that Restoration 1 could end up appearing to be engaged in deceptive marketing practices? Or appearing to lack sufficient credibility through its actual accomplishments that it must pay for fake badges of credibility? 5) Will Restoration 1 continue to promote its inclusion in Dr. John Hayes’ & BizCom’s “12 Amazing Franchise Opportunities” publication and branded spin-off publication, or has our series prompted the notification of past, current and future readers that the publication is paid advertising, not objective selection and analysis by an industry expert? We might be snarky when we are calling BS on deceptive representations, but we are gracious when companies respond in an open and transparent way. In franchising, it just doesn’t happen very often. ARE YOU FAMILIAR WITH THE RESTORATION 1 FRANCHISE, GARY FINDLEY, DR. JOHN HAYES, & BIZCOM ASSOCIATES? It’s unfortunate that Franchising has come down to this but it has and its been like this for a while now. The recession starting back before 2008 hurt franchisors ability to grow or grow quickly. Most Franchisors I know have spent a fortune on franchise broker commissions but Franchise Brokers have been exposed quite a bit as just a bunch of individuals selling whatever franchise opportunities it it appears the prospective Franchisee is interested in. From my experience Franchise Brokers primary interest is selling a franchise, and that is normally put ahead of all other factors like is the franchise a solid franchise business opportunity. With very poor if any enforcement taking place it’s easy for the franchisor to opt for whatever seems to be working at the time, especially if the cost per sold prospect is lower than what they were doing before or if the results seem to be better than what they were doing prior. Franchisors know and understand that the market now is about as hot as it is going to get, the question is how long will the economy hold up where the prospects will have loans available to them or retirement savings they can access. Especially home equity loans which is the main way I see the majority of New franchisees entering the market today. It’s sad that so many Consumers are ignorant to franchising and have not figured out that the vast majority of time they could take the money they are handing over to a franchisor and invest it in there own business and see there chance of survival long term dramatically increase! Prospective Business owners need to consider what the franchisor is really bringing to the table. Is it a system that is so unique that it cannot be found a thousand different places on the internet, is it customers or the hope of customers that the prospective franchisee believes the franchisor will bring them? If it’s clients or customers they believe they will be benefiting greatly from then I highly suggest they investigate that very closely. In many cases there are a number of clients that come from having a national presence but what is the actual profit you will be receiving from each customer? There are some unique and solid franchisors out there that truly bring value to the table when selling franchises but there are way to many that being very little or even worse bring a large heavy chain wrapped around the Franchisees neck keeping them from succeeding. Anyone Considering going into a franchise needs to carefully do their homework with an open mind. Insecurity in your ability to succeed on your own is not a good reason to buy a franchise. Because in the end your ability to succeed could very well be severely limited by the decision to buy a franchise versus opening a business on your own. There are thousands of current and former franchisees that will attest to the fact that buying a franchise did nothing but keep them from being a success or even worse caused them to go bankrupt. All of this can be avoided if prospects will educate themselves and dig deep for the information they are needing to make a wise decision. Yes it can be hard because there is so much deception in advertising and deceptive tactics used but a person can get good information to make a wise decision in buying or not buying a franchise If they want. Not only does Gary Findley practice these deceptive acts to lure more franchisees to buy into his system. In 2015 we are Restoration 1 franchisees had to pay 1% of our total gross to a “marketing fund” that was only to be used for promoting the local franchisee. In their FDD it states every year, that they did not raise or spend any of the marketing fund. It was even left out of the FDD completely. There is ZERO funds accounted for the additional money that we had to put in. Restoration 1 decided that they would NOT claim the additional money and use it to sell more franchises. Under the 2016 FDD which is for the year 2015. For other income Restoration 1 claims only $35,000. Where they got this number is beyond me. I see that over $120,000 was paid into this fund. I did not know that you can take additional funds to a franchisor, not claim it and not even use the fund for what it was designed to be used for. Restoration 1 Franchise Holding is changing the figures from the 2018 FDD to the 2017 FDD. One year they claim they spent $433,707 on Advertising and Promotion. (All franchise sales and ZERO to support the local franchise) The next year Gary Findley thought that no one will look at the previous year numbers and changed the Advertising and Promotion numbers to $386,000. There are other figures that have just disappeared from one FDD to the next. As a former Franchisee that is in a legal battle with Gary Findley and Restoration 1 Franchise Holding. They have stooped as low as wire tapping my phone calls and sending back to their corporate office. Gary Findley portrays himself as this Christian and how not only the CEO but as a franchisee as well. Gary’s local franchise company has been sued for not paying his vendors that he has agreed to pay. Hard to trust in your CEO when he is that crooked. We were one of Gary Findleys vendors for estimating and billing for new franchisees and for his personal franchise’s in Florida and it did come down to we had to sue and got a final judgement. The judge ordered R1 Parkland/Broward to produce a list of their assets and gave them 45 days. To date they have not complied and we received word the principle was liquidating equipment and we were sent a advertisement from a company that was considering buying their cleaning equipment that it was up for sale along with a desiccant. Of course this was after receiving numerous emails that stated we know we owe you the money and we are going to pay. Looks like the judge is going to issue a contempt of court order now for non compliance. We used to attend all the training classes to promote our company, of course R1 was getting 10% of our gross for this benefit on any R1 that used us, and they had bought several licenses for Dash. Frankly I did not believe in Dash for the new franchisee due to pricing and they were aware of this. I was asked to meet with 2 of their field reps and VP, Jay Haus and Curtis Miller and Michah FINDLEY, where they expected my form to push the Dash on the franchisees and wanted me to change my entire system to run off Dash. Of course we all love plausible deniability and at the beginning of what was a “do what we say or else meeting” Michah FINDLEY excused himself out of the meeting. I did not agree to this and our relationship started to get contentious. Gary sent me an email that he expected me to continue to send in 10% of my gross on R1 franchisees using our company. My response was not at all diplomatic as he proceeded to insult me and question my character. I proceeded to remind this “Christian” that not one of my emails ever did I berate him or insult him and yet when he was in disagreement with me that’s what I would get. Insults and nastiness. For posterity sake I did keep all those emails. Interestingly enough when we approached the franchisees we wanted to keep if they would like to stay with us we had a 100% yes and I lowered their fees as I did not have to pay my “rebates” back to R1 Franchise holdings. Nothing surprises me about restoration 1 they are one-sided company do not stand behind any of the franchises that been in business they do nothing for us all they do is take. It really is a joke. I hereby retract the post made on 9/14/18.